Four Ideal Commercial Evomax 80kW wall hung condensing boilers, Frame & Header Kits and brand new Plume Kits have delivered time, space and cost savings for New Forest District Council after being installed at Marryat Court Older Persons Living Accommodation in New Milton, Hampshire. As well as delivering reliable, efficient heating and hot water to thirty-four individual flats, the council has estimated that this refurbishment project will save them up to 25% per year in fuel costs. Marryat Court is one of New Forest District Council’s sixteen Older Persons Living Accommodation buildings. The plant room retrofit was arranged as the existing floor standing boilers had become very costly to run, operating at around 80% efficiency, and the council did not wish to risk the health or comfort of the residents should an emergency boiler retrofit project be required during the cold winter months. Ideal Commercial’s new Plume Kits are specially designed for use with Evomax boilers that need to be installed in awkward locations, as they allow the flue terminal to be easily relocated up to 10m from the boiler. Compatible with Evomax models up to 120kW, each kit includes a standard appliance connector, horizontal flue kit, special rain collar, external plume kit 1m and terminal. Marryat Court’s previous plant room was situated below ground and consequently ground water had caused issues with corrosion over ten years. As a result, Rob decided to relocate the boiler house by making use of a room that had once been the warden’s office, now disused, and the adjacent bin store. The uninhabited office also had the advantage of housing the rising pipe work from the existing basement boiler room. As well as eradicating the risk of ground water issues, the creation of the new boiler room meant that 95% of the boilers, equipment, pipe work and controls could be installed without disruption to the existing heating and hot water, keeping downtime to a minimum and preventing discomfort to the residents. 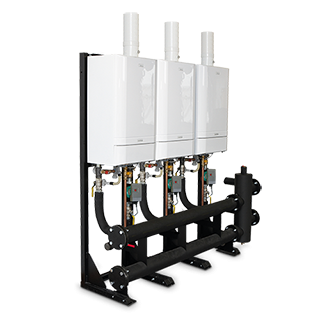 Due to the Evomax’s installer-friendly features, Rob installed the majority of the boilers, headers, plate heat exchangers and pipework as a single-man project. He commissioned a Controls Engineer to install the new control panel and to relocate the Ideal Universal Controller, which had been installed a year previously. Once all the appliances were in place, the changeover from the old water heaters to the plate heat exchangers took less than one hour, preventing any inconvenience to residents. Evomax is Ideal Commercial Boilers’ most efficient boiler to date with seasonal efficiencies of up to 97.2%, and Rob has calculated that the new system will deliver savings of approximately 25%, or the equivalent of £3,000 per year in running costs. 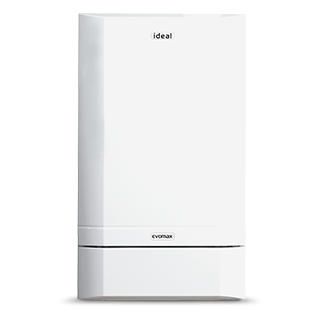 Ideal Commercial’s Evomax offers one of the widest output ranges of any commercial wall hung condensing boiler on the market, and now comes with a 5 year warranty* (terms & conditions apply) as testament to its reliability. The new Plume Kit, as well as other accessories such as the Multiline Flue Cascade, build on the Evomax’s strong reputation for being easy to install by allowing even more siting options.